GDP at 3.5%, eh? Does anyone feel a little bit played by the criminals at Goldman? Uh, huh, if you were following our market thread then you will know that Frank, Myself, and others saw the set up coming following GS’s analyst’s lower expectation calling for 2.7% growth. Turns out it was a set up… they drove the market down only to whipsaw the people who remained short or exited prematurely. Have you ever noticed that good, honest, and reputable people in the investment world disclose their positions when they issue statements or reports? You know, at the end of the business news report, or at the end of Denninger’s “Market Ticker?” That's where you'll see, "No related positions," or something like that to disclose what their conflicts might be. Yet, when you get a market moving “update” from Goldman Sachs, do they reveal their positions? Of course not, don’t be silly. They are not only not regulated by anyone with any teeth, they are the government and KNOW that they can get away with anything - and they do. Heck, they sell billions of dollars worth of WORTHLESS derivatives to municipalities around the globe while betting against the very products they are selling! Cops? Don't be silly. And you might screem, “BUT THAT’S NOT RIGHT!” And you would be right. You would also be right in assuming that there was NO REASON for GS to publish such a bad call - other than manipulating the markets. Turns out that the consensus was actually right in running up their expectations to 3.5%, of course they and the government all reside in Wonderland, where Nate’s B.S. flag is flying at full mast. The Dollar, of course, is down on the news with bonds lower as well. Oil and gold are higher, but I ask, did that report end the historic build ups in crude? Is growth and demand really there, or is it all trumped? Today's moderate increase for third quarter GDP should provide some psychological lift for consumers and businesses since it is the first positive growth for the overall economy in just over a year. And financial markets are likely to like it since it is all about expectations and the advance estimate topped expectations. Real GDP in the third quarter rebounded an annualized 3.5 percent, after declining by only 0.7 percent in the second quarter. 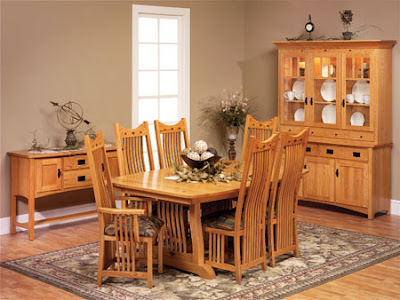 The third quarter boost came in above the market consensus for a 3.0 percent increase. 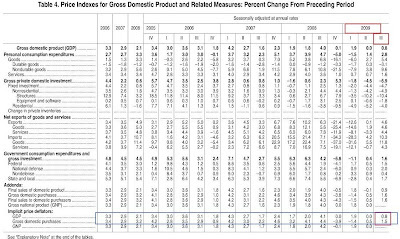 The improvement in real GDP in the third quarter primarily reflected upturns in personal consumption, inventory investment, exports, and residential fixed investment and a smaller decrease in nonresidential fixed investment that were partly offset by rise in imports, a downturn in state and local government spending, and a deceleration in federal government spending. Indeed, some of the component numbers were encouraging. PCEs rose an annualized 3.4 percent, led by durables with a 22.3 percent jump. Residential investment made a partial rebound of 23.4 percent-the first gain since a 2.6 percent rise in the second quarter of 2006. Inventories did add to third quarter growth but the "increase" was actually less of a decline in the change in inventories. Businesses are still facing lean inventories and any rise in demand could boost production for inventories. Both exports and imports were up after a string of negative quarters for both. Cash for clunkers did add substantially to third quarter growth as motor vehicle output added 1.66 percentage points to the third-quarter change in real GDP after adding 0.19 percentage point to the second-quarter change. Year-on-year, real GDP improved to down 2.3 percent from minus 3.8 percent in the second quarter. Inflation is still subdued as the GDP price index edged up 0.8 percent, following no change in the second quarter. The consensus had projected a 1.4 percent rise in the latest period. Today's report should be a positive for equities, possibly damping the view that stocks are in a correction. 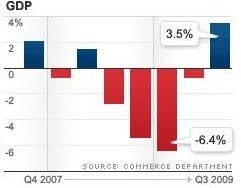 Note that the 3.5% growth number is the growth for the quarter annualized (GDP X 4), that means that the quarterly growth was .875%, according to those who manipulate, errrr - compile, the statistics. The growth figures are all subject to compilation errors and we include government spending as “growth,” despite the fact that government spending subtracts from the economy, and does not in reality add to it. We then let the BEA tally up all their data (each category of course has its own tallying, and errors, to be done), and then that figure is adjusted for inflation via the “deflator.” This is one of the largest sources for error as the BEA is allowed to take inflation data and adjust to “real” growth. If inflation is positive, as is normally the case, the deflator is used to subtract out inflation to find their real growth. If inflation, however, is negative, then it is added to find “real” growth, right? Right, sometimes, only not ever as is witnessed in this table from the BEA’s GDP report which follows. Note that they used .8 as a deflator for this quarter’s adjustment, much less than the historical norm and less than the consensus 1.4% (yet the consensus headline beat), but not a negative number as one would expect with a negative CPI and negative PPI. That’s because the BEA uses their own numbers to produce the deflator that seem to have no basis in reality as do many of their adjustments that can be found in their “price index” and “quantity index” figures. Computations on top of computations built upon assumptions. It’s a mess, really, and you’ll find that when you really dig into this report that they are even placing a value on new construction, etc. How do they value that construction, do they value it like Goldman or JPM value their derivatives, or is it all just nonsense? 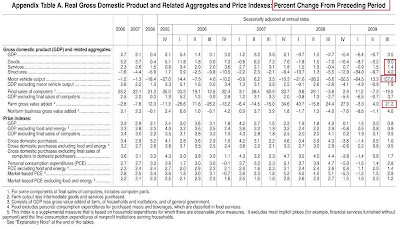 And take a gander at this table that shows quarterly changes expressed in percentage terms. Are you telling me that third quarter motor vehicle output increased by 157%!!! Riiiiight. Cash for Clunkers was a Keynesian hit, but it sure as heck did not cause output to more than double. And do you believe with what you know about tax receipts and retail sales that goods have moved from -8.7% six months ago to +9% in the past quarter, an 18% swing? Riiiiight. Meanwhile tax revenue, shipping, trade, credit, sales, home prices, CPI, and PPI are all heading lower as oil and natural gas inventories build. Something isn’t adding up… in Wonderland where the only true growth is in government debt and bond offerings. Sure they’re getting better… for Goldman, JPM, and WFC. Raise your hand if you really believe that we went from -6.4% to +3.5%, a 9.9% swing in the past two quarters? I didn’t have much confidence in our paper economy before, I have even less confidence in it now. There are huge adjustments in this report, especially for imports and for autos. They are amplified as the quarterly figures are multiplied to produce an annual figure. It’s very likely, in my opinion, that as those one quarter positive adjustments reverse that GDP will resume its downward trend – subject to all sorts of manipulations, of course. Of course I believe that the GDP report is so messed up that it overstates reality by AT LEAST 20%. Remove government spending and it’s overstated by as much as 40%. Again, I would dismantle the BEA and all government agencies that produce statistics and I would completely start over – a big subject and a big dream, I know. Jobless claims are not offering a clear indication of what to expect for the October employment report. Initial claims held steady for a fourth straight week, edging 1,000 lower to 530,000 in an Oct. 24 week that was not skewed by special factors. The four-week average is at 526,250 and does show improvement, down about 20,000 vs. this time last month. Continuing claims, where the latest data is for the Oct. 17 week, fell substantially, down 148,000 to 5.797 million and, for the first time since April, bringing the four-week average below 6 million at 5.961 million. But the improvement reflects an uncertain mix of hiring together with the expiration of benefits. Those receiving emergency compensation fell more than 21,700 to 3.369 million with those receiving extended benefits down more than 49,300 to 526,700. Today's GDP report shows significant strength but continued strength will depend on improvement in the labor market. The next key reading on the labor market will be the ISM's manufacturing employment index on Monday followed on Wednesday by ADP's payroll count. The energy giant says lower commodity prices weighed on sales and profit during the third quarter. NEW YORK (CNNMoney.com) -- Exxon Mobil reported a bigger-than-expected 68% decline in third-quarter earnings Thursday as weak oil and gas consumption weighed on the company's profit margins. The world's largest publicly traded oil company said it earned $4.73 billion in the second quarter, down 68% from $14.83 billion a year earlier. On a per-share basis, Exxon said it earned 98 cents, down from $2.85 in the third quarter of 2008. The results were below forecasts. Analysts surveyed by Thomson Reuters were expecting earnings of $1.03 per share. Revenue plunged to $82.26 billion in the quarter from $137.74 billion a year earlier. Sales were lower than the $85.16 billion analysts had forecast. The results were "impacted by lower commodity prices and weak product margins," Exxon's chairman Rex Tillerson said in a statement. Oh my, how can this be? Isn’t this the same quarter that the GDP GREW by 3.5%??? We have yet to eliminate the possibility of that final EW wave higher, so it will be interesting to see the technical results after today’s action. 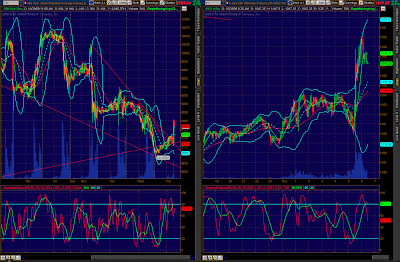 Will this simply be a corrective wave on the way down, or is it another wave, the final EW push higher? Stay tuned, watch the pivot points (1,061 overhead, 1,041 support) and the reaction as prices attempt to reenter their rising wedges.